Your privacy is of utmost importance to Deerhurst Resort and, accordingly, we comply with current Canadian privacy legislation. Moreover, we ensure the safeguarding of your personal information and implement our own best practices that are enforced across Deerhurst Resort and all of its brands. Specifically, following your implied and/or express consent, you will receive communication from us featuring various Deerhurst Resort offerings, including Deerhurst Resort Residences and Amenities. At times, and following your consent, you may also receive news about collaborative promotions with very carefully selected Deerhurst Resort partners. However, at no time will we release your email address to any third party outside of Deerhurst Resort . Furthermore, please note that an unsubscribe mechanism will always be set out clearly for you so that you can easily withdraw your consent to receive further communication from us at any time. We interpret “Personal Information” as meaning information that specifically identifies a Guest as an individual and is provided to or collected by the Resort. The type of Personal Information the Resort collects, uses and discloses may include without limitation, an individual’s name, residential mailing address, residential phone numbers or email addresses, personal financial and credit information, verification of age for age-related programs, citizenship, place of employment, and personal preferences. Such other specific purposes which are communicated to the Guest by the Resort and its staff before collection. By making a reservation or by using Deerhurst Resort services. it is necessary to have your information in order to identify you, contact you and to process your purchase and requests.This information usually includes your name, address, phone number, e-mail address, credit card number and expiration date, and language preference.It may also include, if you choose to share that information with us, your preferences regarding the delivery of your service such as type of room, type of bed, and the like. By providing it to us in communications regarding service delivery such as comment cards. Information provided to us in such a fashion will be used solely for the purpose of recording your comments, communicating with you in respect of them, reviewing them with hotel personnel, for the purposes of recognizing employees for excellence of service delivery and for developing improvements in service delivery. By providing the information to us by participating in a marketing initiative. To sign up for this service we require you to provide us with your e-mail address, first name, last name, language preference, and country of residence. You may unsubscribe at any time using the link provided on every e-mail message and you will no longer receive e-mail offers and promotions for the specified subscription or website, as the case may be.You may at any time in the future opt-in to receive e-mail offers. We also partner with third parties to manage our advertising on other sites. Our third party partners may use technologies such as cookies to gather information about your activities on this website and other sites in order to provide you advertising based upon your browsing activities and interests. If you wish to not have this information used for the purpose of serving you interest-based ads, you may opt-out by clicking here or if located in the European Union clicking here. 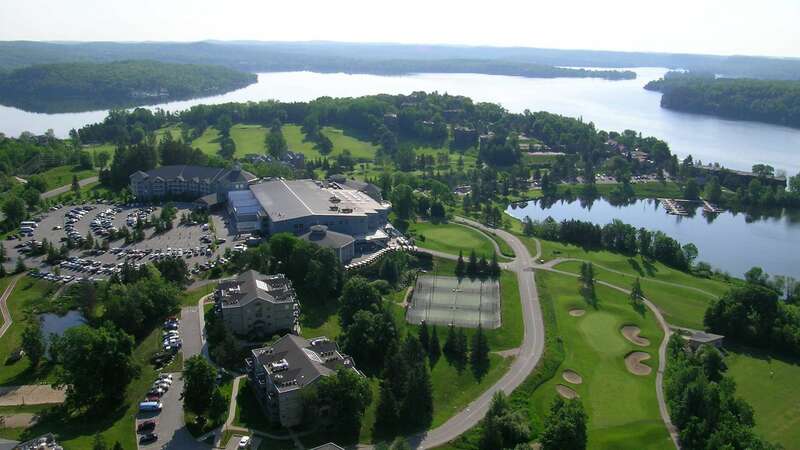 Deerhurst Resort may provide links to a number of other web sites that we believe will be of interest to you. However, those sites may not follow the same privacy policies as Deerhurst Resort. Therefore, we are not responsible for the privacy policies or the actions of any third parties, including without limitation, any web site owners whose sites may be reached through this Site, nor can we control the activities of those web sites. We urge you to contact the relevant parties controlling these sites or accessing their on-line policies for the relevant information about their data collection practices before submitting any personal information or other sensitive data. The Resort does not collect, use or disclose a Guest’s Personal Information without their knowledge and consent, except in certain extraordinary circumstances. Such extraordinary circumstances include without limitation, when legal, medical or security reasons make it impossible or impractical to obtain consent. We do disclose personal and other data to third-party service providers such as companies that provide website hosting, data analysis, payment processing, customer service, email delivery, marketing and other services. Our Guests may choose to “opt out”, thereby withdrawing their consent at any time, subject to any legal or contractual restrictions and reasonable notice. A Guest’s refusal to provide, or withdrawal of, his/her consent may affect the Resort’s ability to provide the Guest with its services. The Resort will inform the Guest of the implications of such withdrawal. To withdraw consent, a Guest should contact the Chief Privacy Officer at 1235 Deerhurst Dr HUNTSVILLE ON P1H 2E8 or at privacyofficer@deerhurstresort.com. The Resort strives to ensure that Guest’s Personal Information is as accurate, complete, and up-to-date as is necessary for the purposes for which it is used. The Resort has security safeguards in place designed to protect against loss, theft, unauthorized access, disclosure, copying, use or modification of Guest’s Personal Information in the care of the Resort. The nature of the safeguards will depend on the sensitivity, format, location and storage of the Personal Information. The Resort will provide a Guest access to their Personal Information in a timely fashion upon identity verification. The Resort will correct or amend any inaccuracies in the Guest’s Personal Information. The Resort will delete a Guests information upon request.